We recently released version 0.15.2 as a mandatory security update for the GameCredits network. This release includes a first-of-its-kind integration with the Komodo platform, allowing their blockchain to frequently “notarize” or write down certain block hashes into their chain as a backup system. We’re incredibly excited about this Komodo integration, as it offers an extra layer of security that very few other POW coins currently have. 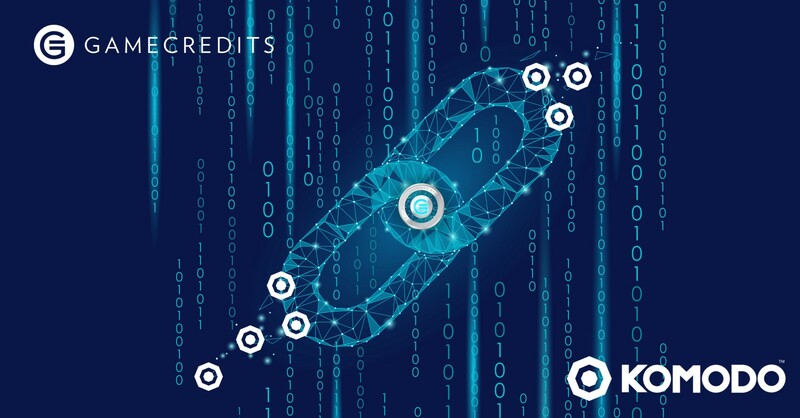 In fact, GameCredits is the first coin to be interchain linked with Komodo. Let’s go into some technical detail to explain how this integration works and why it will have such huge benefits for GameCredits. 1) An attacker sends a transaction. 2) The attacker mines blocks on a chain with his/her own or rented hashpower (usually by forking off), but refuses to broadcast these blocks on the network. These blocks do not contain his/her original transaction from step 1. 3) The attacker’s transaction is confirmed on a service (like an exchange), so he/she gets credited for the transaction. 4) The attacker broadcasts the blocks on the network, erasing the existence of his or her transaction. Now he or she has been credited coins on the service he/she sent to and he/she still has the coins. Our new Komodo notarization feature greatly reduces the impact of such an attack. Komodo notaries are running GameCredits clients and monitoring the network 24/7/365. At a certain interval of blocks, these notaries get the hash of a block and write it into the Komodo chain. They also note down which Komodo block has the notarization within the GameCredits chain. For example, say GameCredits’ blockchain is notarized every 5 blocks by Komodo. This would mean that every 5 blocks (or 7.5 minutes given GameCredits’ 90-second blocktime), GAME is notarized on the Komodo chain. This two-way peg allows GameCredits’ block history to be secured by the Komodo network. If an attacker attempts to double-spend on the chain, but the real chain has already notarized several blocks since he forked off, the attacker’s blocks will be rejected by the network. The beauty of this is that the Komodo chain is notarized by Bitcoin. Komodo’s chain is secured by Bitcoin’s hashpower, and GameCredits’ chain is secured by Komodo. Below you’ll find our GitHub release page, which contains all the binaries for this release, as well as notes on the changes. For our more technical readers some smaller but still notable changes include transaction indexing enabled by default, message signing string bug fix, and a segwit and csv signaling period change. As many of you already know, several exchanges — including Bittrex and Poloniex — shut down trading or halted deposits and withdrawals a few weeks ago. This was because of the network attack we stated above. However, with the 0.15.2 Komodo network update, these attacks will be far more difficult, meaning exchanges can safely come back online. Since we distributed the code last week (the week beginning Monday 28 May), several services and exchanges like Poloniex have already updated. We are also communicating with Bittrex to help them update as soon as possible. This particular update has taken longer because the Komodo integration is the first of its kind and requires slightly more work than other updates. We want to stress that users’ funds are safe, and that our team has followed the proper protocol to get services online as quickly as possible. This interchain integration between Komodo and GameCredits is the first of its kind. With it, our hope is to keep our POW chain secure and scalable for years to come. But even with this integration, we want to stress that GameCredits will continue to work on further network improvements. Despite this frustrating period of downtime, we’re really thrilled about this latest development and what it’s going to mean for our community. We look forward to providing further updates soon, and we thank everyone for their patience and support. And aspecial thanks to the Komodo Platform team for working closely with us to make this update possible! Have questions? Find us on Discord, Telegram, Twitter, Facebook, or Reddit!